1. Shake the girls. Give your breasts a good shake before each pumping session. This wakes up the breast and helps release hind milk from the back of the breast. 2. Use the stimulation and let down modes on your pump more often. Use the stimulation mode for 2 minutes followed by the let down mode for 4 minutes. Go back to the stimulation mode for another 2 minutes followed by the let down mode for another 4. 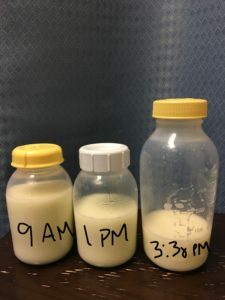 Do this up to 4 times in your pumping session to see an increase in your milk. Massaging your breast from top to bottom in a clock wise motion will also help empty the breast. End your pumping session with a few minutes of hand expression. 3. Keep well hydrated. Water water water!!! 4. If you feel like you did not pump enough during the day at work, add in an extra pumping at night before you go to bed. Keep this extra pumping going even if your home with your baby for the weekend. You can stock up this milk in your freezer for those occasional days where you don’t pump enough on your shift. For more tips and tricks, feel free to give me a call, attend one of my working mother classes, or schedule a personalized consultation!